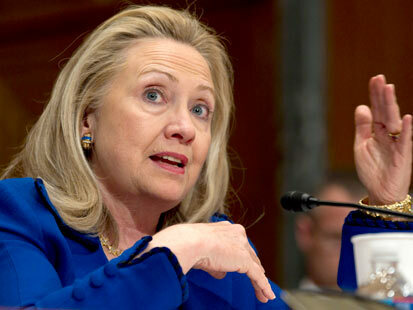 Hillary uses hand gestures to show how big it should be. WASHINGTON, D.C. — Secretary of State Hillary Clinton emerged from two back-to-back Senate committees today without a clear momentum for the fiscal year 2013 State Department budget.The agency has requested $54.7 billion in funding, an increase of 2.6 percent. Clinton says the request represents slightly over 1 percent of the total federal budget and doesn’t cover the rate of inflation.Sen. Patrick Leahy, D-Vt., called the proposal “budgeting by inertia” and said it disproportionately allocated resources to Iraq, Afghanistan and Pakistan given rising issues in East Asia and the Americas. Leahy is the chairman of the Senate Appropriations subcommittee responsible for the State Department budget.“It’s going to be difficult to get a bill through this year,” Leahy said. But “painful cuts” had already hit the department, according to Clinton, including an 18 percent decrease in funding for Eurasian programs. Clinton told the panel the embassy was still in the process of “right-sizing” its resources. Earlier this month it was announced State had would cut 10 percent of funding from the program. The State Department budget includes a new $770 million fund that Clinton says would be used exclusively for unexpected issues to arise in the Middle East and North Africa. According to the secretary, during the early days of the Arab Spring the State Department had to “carve out” $360 million from existing programs to support U.S. efforts, a tactic that proved logistically “awkward.” The new fund would be a savings bank specifically for unanticipated regional issues. Secretary Clinton says it was inspired by a similar program used during the fall of the Soviet Union to counter hunger in Poland and Hungary. Clinton faced panels from the Senate Foreign Relations Committee and the Senate Appropriations subcommittee on State, Foreign Relations, and Related Projects. Russian Prime Minister Vladimir Putin warned Russians that his enemies may kill a prominent opposition figure in order to fuel public outrage against the government. MOSCOW—Prime Minister Vladimir Putin strongly warned his opponents against unsanctioned protests after Sunday’s presidential election, in which he is all but certain to regain the presidency. In a statement reflecting heightening tensions four days before the vote, he also alleged Wednesday that his foes may kill a prominent opposition figure in order to fuel public outrage against the government. Putin criticized the opposition plans for rallies over what it fears will be a fraudulent election, saying Wednesday it is “unacceptable” to prejudge the vote. “We will respect any viewpoint but are calling on everyone to act within the framework of law and use only legitimate means,” he said at a meeting with his campaign activists. Evidence of widespread vote-rigging in favour of Putin’s party in December’s parliamentary election fueled a series of massive protests in Moscow demanding an end to Putin’s 12-year rule. Their organizers had received the authorities’ clearance in advance to avoid any violence. Civil society and opposition activists have turned out en masse to act as observers at the polls to prevent violations. They are also bracing up for demonstrations after the vote. The opposition is now pushing authorities to allow a postelection protest at a venue even closer to the Kremlin. The Moscow city government has refused the demand, offering other more distant locations instead. The organizers have rejected that offer, raising the threat of violence. Putin claimed Wednesday that unidentified forces abroad are plotting provocations against authorities after the vote. He has repeatedly claimed that the U.S. is stoking up protests in order to weaken Russia. Putin, who was Russia’s president from 2000 to 2008 and has been prime minister since then, is running for a third, now six-year presidential term. Polls have showed he is likely to easily defeat four Kremlin-approved challengers, but his statements Wednesday reflected strong concern about the opposition protests. Previous rallies in Moscow that drew tens of thousands in the largest show of discontent since the Soviet times were sanctioned by authorities and went on peacefully. Putin seems to command the strong loyalty of police and other law enforcement agencies, which have seen significant wage increases recently. But a violent confrontation after Sunday’s vote could fuel public anger against Putin and destabilize the situation. As soon as the situation in Afghanistan can change dramatically, exposing as a fundamental transformation of the entire system of regional security. According to “AP”, a renowned expert, a senior researcher at the Institute of Oriental Studies, Alexander Knyazev, citing sources in circles close to the governing bodies of the SCO, in fact, the Russian leadership decided to close in the near future, the so-called NDN, transit route for supplying the troops U.S. and NATO forces in Afghanistan. “The motives of the Russian leadership caused by the lack of U.S. coherent, adequate response to the position of the Russian Federation on the situation in Syria, the situation around Iran, the U.S. reluctance to listen to Russia’s proposals on European missile defense,” – said Knyazev. He also did not rule out the connection of this solution with the pre-election situation in Russia. “As I said, an important factor in making this decision is the irritation of the Russian leadership’s blatant U.S. intervention in the internal affairs of Russia, Russia’s open support of” off-system “of the opposition and undisguised attempts to prevent the election victory of Vladimir Putin,” – said the prince. It is not clear yet, the expert adds, is whether to go as the provision of air corridors.In this case, the question will be the fate of an American military base at the airport “Manas” in Kyrgyzstan and the French Air Force bases and the German Bundeswehr in Tajikistan and Uzbekistan respectively. Given that this path is now up to 90% of all deliveries, and outstanding opportunities through Pakistan is very limited and uncertain, it would actually mean the isolation of the US-NATO coalition, and with and without the complicated military situation in Afghanistan could turn it into a new Vietnam to the United States. Meanwhile, another 9 February, Foreign Minister Sergei Lavrov said that Russia and NATO are in talks on expanding supply routes of cargo to the International Security Assistance Force in Afghanistan. “Recently, we discussed additional routes, which will include a multimodal transport Rail and air transport “, – said Lavrov. This month Washington whose commitment to fighting drug production in the US occupied Afghanistan is widely called into question rolled out a new plan of coordinating the activities of Central Asian republic’s anti-narcotic agencies. The initiative was, however, promptly blocked as potentially counterproductive by Russia, the country hit hardest by the Afghan drug output. Serious suspicions arise in connection with Washington’s bid to tap, in the framework of the program, into the bulk of classified data maintained by the law-enforcement agencies of the host republics, as the information can easily be invoked to exert pressure on Central Asian administrations. Moscow cited the argument to convince its Collective Security Treaty Organization partners – Kazakhstan, Uzbekistan, Tajikistan, and Kyrgyzstan – to refrain from signing the statement drafted by the US. 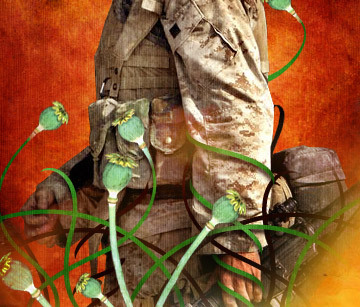 Drug production in Afghanistan has reached ominous proportions and is known to be swelling. According to the UN Office on Drugs and Crime, the country’s narcotics output rose by 61% in 2011 compared to 2010 – from 3,600 to 5,800 tons. Notably, over the time the area used for drug cropping expanded only by 7% and most of the output increase is attributable to bumper harvest across the drug plantations. A circumstance not to be overlooked in the context is that the opium prices are rising continuously and added 133% in 2011, meaning that demand for drugs is currently outpacing supply. In 2010, opium price growth was driven by supply contraction as a fairly mysterious fungal decease wiped out a large part of opium poppy crops. Drug production did start to climb in 2011 in the regions where the epidemic had taken place, even in Kapisa, Baghlan, Faryab provinces formerly reported to have completely dropped out of the game. Overall, drug production has become the key sector of the Afghan economy over the period of the US occupation, and the fact by all means merits deeper analysis. The UN currently estimates the 2011 revenues of Afghan poppy farmers to top $1.4b, which is equivalent to 9% of Afghanistan’s GDP. Deploying US special forces in Central Asian republics is a recurrent theme on Washington’s foreign policy agenda. In 2009, for example, the US declared dispatching to all the five of them commando units charged with the mission of keeping secure NATO’s Northern Supply Route To Afghanistan. The White House went public with a plan to construct security infrastructures in Central Asia in August, 2010. Specifically, US Central Command’s counter-narcotics fund intended to pour over $40m into building training compounds in Kyrgyzstan’s Osh and Tajikistan’s Karatog plus a canine training facility and helicopter hangar near Almaty in Kazakhstan, and into an upgrade of a number of border-crossing checkpoints in Uzbekistan, Tajikistan, and Kyrgyzstan. In the majority of cases, the installations are strategically located – for instance, a facelift awaited Turkmenistan’s Sarahs checkpoint sited on the Turkmen-Iranian border and Kyrgyzstan’s checkpoint in the proximity of Batkent, a position key to the Fergana Valley. Speaking of the cooperation under the umbrella of the Collective Security Treaty Organization, its drug enforcement coordination must be credited with steadily improving efficiency. The Kanal-2001 raid jointly launched by the group’s members last December led to the seizure of 16 tons of drugs including 500 kg of heroin, over 2 tons of hashish, 9 tons of opium, and around 130 kg of cocaine. In concert, the Treaty partners’ law-enforcement agencies opened over 21,000 criminal cases, 3,400 of them being related to illicit drug circulation. It is indicative of the progress being made that the grab in a similar 2010 stint was modest in comparison, totaling just 7 tons of drugs, while the number of agents involved was several times higher. Moscow’s bilateral ties with Central Asian republics in the drug enforcement sphere also help – thanks to the Russian assistance, Kyrgyz border guards managed to boost the amounts of confiscated narcotics by a factor of 23 over just one year. The US push for the creation and operation under its control of an alternative Central Asian drug enforcement architecture is naturally seen apprehensively against the background, especially considering that Washington rejects on a wholesale basis the initiatives targeting drug production within Afghanistan. Russia floated a series of proposals at the aforementioned Vienna conference such as compiling an interactive real-time map of drug crops in Afghanistan to guide eradication raids, using satellite surveillance to detect drug trafficking, equipping border guard outposts with advanced technologies, etc., but neither of the ideas resonated with the US. As before, Washington opposes eradication on the pretext that it would leave Afghan farmers unable to fare for themselves, and, moreover, shuns Russia’s initiative to subject to strict control the precursors to heroin and other complex opiates. Precursor codification could make it possible to track their origins and, eventually, to radically cap hard drug production, but it seems that this would not be the result to the US Administration’s liking. The inescapable conclusion stemming from the analysis of the US position vis-a-vis Afghanistan’s drug problem, attempts to perpetuate in some form its military presence in the country, and efforts to make inroads into Central Asia is that the intensifying flow of drugs from Afghanistan to Russia and across it to Europe is regarded as an at least acceptable phenomenon in Washington. PITTING PASHTUNS AND BALUCHIS AGAINST EACH OTHER A SOLUTION TO BALUCHISTAN? When the Baluchis are being Persecuted for last 65, Years through Operation starting since 1947, When Pashtun were Fighting and Liberating Kashmir on Orders of Quaid I Azam through , Trained Armies of Khans of Dir , Ambh Hazara and Wali Swat and many FATA tribesmen who were under command of GHQ Army men like Asghar Khan and His Fauji Brothers who were commanders in NLI, ( Northern Light Infantry of Gilgit) . The Rest of Pakistan Army was busy surrounding another Khan, the Khan of Kalat in Pashtun Areas of Baluchistan. This was being Done on Orders of Same Quaid I Azam and Liaqat Ali Khan who were Promised by Nawab Akbar Bhugti in 1947 to Join Pakistan Although he had no Mandate in Baluchistan controlled by Khan of Kalat . In Beginning in 1947, when it was the Pashtun who did not want to join Pakistan and later in 1970,s too when Pushtunistan issue was Stamped Falsely on NAP Government and was raised artificially, through Baluch Nawab Akbar Bhugti who in Partnership with Punjabi Dominated GHQ , Bureaucracy and PPP,s CM Punjab Mustafa Khar , used the Baluchis Especially the Nawab to Crush the Pashtuns . Their elected representatives of National Awami Party of Wali and Ghaffar Khan Led Government in Baluchistan and NWFP Including Murree and Mengals Baluchis , Minus Nawab Akbar Bhugti was Dissolved by Force and They were Charged with Treason in Hyderabad Conspiracy case. While Nawab was Given Governor and chief Minister ship of Baluchistan. Now Powers who were Supreme then and now want to Reverse the Tide of History and now want to use the Pashtun against the Baluchis to solve their Problems with Baluchis and especially when their Only Ally Nawab Bhugti was Killed by Army Action by General Musharaf. Now a Pashtun General Obaid Ullah Khattak is made as IGFC Baluchistan and it is being used to launch Attacks against the , Feuding Baluchis to make them Abducted and Disappeared while Shifting the Blame on Pashtun General and his Recent Interview has raised many Eye Brows of Pashtuns in Pakistan who term this Negative and Below the belt Type Policy as Hateful. Since in Corps Commanders there is not a Single Pashtun , who Makes the Policies of GHQ , just a Lone IGFC Baluchistan does not matter , But is follower of Orders , but drums are being beaten especially by Media that as if it is Policy of Pashtun General Obaid Khattak. Is this Policy of Causing further Blood shed of Pashtun’s through Pitting Pashtuns towards Baluchis to save Lives of Punjabis is both Bitter and Inhuman. Since in Baluchistan the Population of Pashtun and Baluchis are about 50-50%, Would further Bloodshed solve Problems in Baluchistan? Commercial sources familiar with operations on the Northern Distribution Network, a key supply line for the Afghan war effort, say that Uzbekistan is “continuously uncooperative” when it comes to facilitating the shipment of goods to US and NATO troops in Afghanistan. The hassles are such that some Pentagon contractors now try to avoid dealing with Tashkent when possible. “Only the very big US government flag carriers are able to operate with any ease or success in Uzbekistan because they have clout and can negotiate with the Uzbek government,” a Washington, DC,-based source said. Uzbekistan has the most developed railway network of any Central Asian state and thus serves as a hub for Northern Distribution Network (NDN) traffic. At the same time, the country is consistently listed by global watchdogs as one of the most corrupt and repressive states in the world. In late 2011, members of the US Senate Appropriations Committee expressed concern that the NDN was a potential gravy train of graft which enabled Uzbek President Islam Karimov to reinforce his authoritarian regime. As it gears up for the withdrawal of American forces from Afghanistan, US Defense officials are taking a hard look at expanding routes that circumvent Uzbekistan. In particular, Pentagon officials want to develop routes in and out of Afghanistan that will “grow to be larger” than the NDN. Transporting goods by air is generally far more expensive than by ground. Attendees also explored the “much cheaper” option of trucking goods from Europe to Afghanistan via Turkey. “This will be an alternate to many of the routes,” the TPPS meeting minutes record. SDDC customer advisories urge transporters to consider using a Trans-Siberian route. “Trans-Siberian Route (TSR): [Points of Delivery] Vostochny, Russia; and Vladivostok, Russia. TSR is a viable option to move NDN eligible cargo from [US Pacific Command Area of Responsibility] and US West Coast,” stated an SDDC advisory on December 13. “If you can avoid using Uzbekistan then it’s good to do that,” the source added. Despite a growing distaste for Uzbekistan, contractors say that, given Tashkent’s geographical position, there is no way to marginalize the country entirely. For one, the rail connection between Uzbekistan and Afghanistan is irreplaceable. Some 60 percent of fuel deliveries to US forces in Afghanistan are shipped via the NDN, and the bulk passes over the Termez-Hairaton crossing on the Uzbek-Afghan border. The US Army and Air Force’s requirements for fuel are not projected to decrease in the near future. Uzbek authorities seem intent on profiting as much as they can from the war effort, while they can. Specifically, Tashkent is set to impose a drastic hike of transit fees for items being withdrawn from Afghanistan. According to the latest NDN transit agreements for Kazakhstan and Uzbekistan, copies of which were obtained by EurasiaNet.org, Uzbekistan will charge carriers of non-military goods leaving Afghanistan up to 50 percent more than the existing rate for use of the railroad. Carriers also face a level of bureaucracy that is not evident in the agreement signed with Kazakhstan. Earlier transit agreements with Tashkent set rates “in accordance” with the International Railway Transit Tariff. Carriers must also repeatedly apply for permission to transit goods out of Afghanistan from the Uzbek Ministry of Defense, which will then specify exactly at what time the cargo may be moved. Despite the general perception that Tashkent’s NDN cooperation is grudging, the United States will need to keep Tashkent on board, the source warned. “The decision’s been made not to move vehicles or anything armored through Tajikistan or Kyrgyzstan, this means it will have to go through Uzbekistan, and most likely through western Kazakhstan for delivery on to Poti,” the source said. CHENNAI: The Tamil Nadu police on Monday arrested a 50-year-old German national who allegedly raised funds for protests against theKudankulam nuclear power plant. Tamil Nadu ‘Q’ branch sleuths, who monitor the activities of non-governmental organisations (NGOs) in the state, arrested Sonnteg Reiner Hermann in Nagercoil on Monday. They brought him to Chennai in the evening. Immigration officials said they have cancelled Hermann’s visa and that he would be deported early on Tuesday. Police sources said Hermann had come to India on a tourist visa. The arrest comes close on the heels of the anti-nuke protestors threatening to sue PM Manmohan Singh for telling a journal that Indian NGOs were getting funds from the US and western Europe to stall the construction of the Russia-aided Kudankulam nuclear reactor. Acting on a tip-off from the Centre, the ‘Q’ branch conducted surprise checks at a lodge in Nagercoil and picked up Hermann for questioning. They searched his room and found evidence that he had been mobilising funds for the anti-nuclear activists, an officer said. and found that he was in touch with Lalmohan, a close aide of Udayakumar who is leading the anti-nuclear agitation in Kudankulam," the officer said. MoS in the PMO V Narayanasamy said the Centre had cancelled licenses of three NGOs in south Tamil Nadu. "These NGOs have violated the Foreign Contribution Regulation Act and therefore their licenses have been cancelled. They did not maintain proper accounts and did not use funds for the purposes they were meant for," Narayanasamy said. Central agencies are also probing the activities of some NGOs that receive funds from the US and Scandinavian countries and are spending huge amounts on the anti-Kudankulam agitation. TN cops arrested Sonnteg Reiner Hermann from Nagercoil for mobilising funds for the anti-nuclear activists. Cops said his phone call records revealed he was in constant touch with a close aide of Udayakumar, who is leading the Kudankulam agitation.